If there have been two criticisms that have followed Lionel Messi around though his career like yappy little dogs nipping at his ankles—too insignificant to be an actual threat, and just persistent enough to register as a minor annoyance—they have been these: First, he had the good fortune of playing on a superteam alongside Xavi, Andrés Iniesta et al while being coached by all-time great manager Pep Guardiola, who devised the perfect scheme to maximize his talents; second, that he couldn’t have done what he has done had he played in England. What this amounts to is saying that because Messi played with other extremely good players in a uniquely perfect system, he’s not actually as good as he seems. While Messi has yet to and probably never will leave his Barcelona buddies in his prime, he seems to take special joy in shattering the first myth when given the opportunity to compete against and dismantle teams run by Guardiola, architect of the famous Barça tiki taka. (I wonder if Jérôme Boateng can yet bring himself to watch the carnage.) As for whether Messi could do it on a rainy night in Stoke, he loves obviating that dumb line of argument by smashing up the actual best Premier League squads when he faces them, most prominently over the past couple seasons in his performances against Manchester City. Thus it was no surprise that when the Argentine genius met an English Guardiola team, he methodically took them apart. As is always the case with great Messi games, the individual highlights—as impressive as they usually are—can’t encapsulate his inimitable method of dominance. There’s the way he moves the ball around the pitch, knowing when to play a safe ball back into midfield to maintain possession and when to go for the jugular with a through ball only he could execute; the way he charges into a mass of defenders and somehow comes through the other side with the ball still glued to his left foot; and how he dictates the entire match by where he moves and what he does with and without the ball. No one can approximate what he does when he’s really feeling it. As should have been obvious coming into the match, there was no better time for Messi to be in that mood to wreck everyone and everything than when confronting his old boss and his new favorite British victims, Man City. 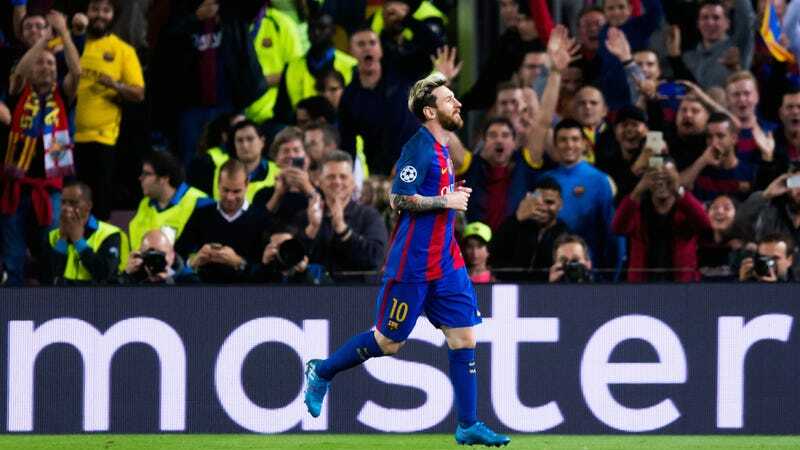 It wasn’t even as lopsided of a match as the scoreline might suggest, other than the fact that Messi was, as he almost always is, the counter-weight that tipped the scale in Barcelona’s favor. For English teams, Messi’s ire makes some sense. But man, Pep has to be sitting back, thinking to himself, What on earth did I do to deserve this?